I typically pride myself on remaining flexible about race registrations. I like to feel ready and able to jump into an event at the last minute if it sounds interesting, fun or rewarding. But a case of goal overload leading up to the Bolder Boulder 10K and the 4.4-mile Great Chesapeake Bay Bridge Swim has led me do a bit of advance planning for my races over the next few months, so I don’t feel such a crunch to train for more than one biggie at the same time. And guess what? It’s actually pretty motivating to write some race dates on the calendar *before* the calendar fills with other obligations (Full disclosure: Yes, these dates are written in pencil.). Rockville Rotary Twilight Runfest 8K 8:45 p.m. July 16. And it’s only $31 through June 30! Finishing the Daiquiri Deck Tropical Splash last year. Philadelphia Half Marathon. Nov. 20. Finish the ski-patrol training I had to postpone after an ACL tear: Not a race, but certainly a commitment that will take up some physical energy in December. Yuengling Shamrock Half Marathon. Virginia Beach, Va. March 17, 2012. Great Chesapeake Bay Bridge Swim. June 2012. Finishing the Great Chesapeake Bay Bridge Swim this year. 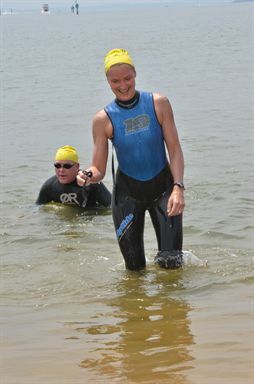 And yet, I'm still anxious to do the swim again next year. Hm… My mind is wandering to August 2012. Hellespont anyone? My key motivator now is my calendar up to September. Running requires focus with three tris and a 6k. And cycling as I’m doing a 200k with friends. hey, I’m thinking about the philly half too – how fun would THAT be? also thinking about rockville, but night summer races, ugh. I’ll be in Philly for the marathon and am about 99% sure I’m going to sign up for the Shamrock half. I definitely need to have races on the calendar to keep myself motivated. Not to be all cheesy, but your Chesapeak Bay swim is motivating me. I’m a week and a half out from wrist surgery for a distal radius fracture. My doctors are very optimistic about my recovery, but everyone else seems to love to let loose with their horror stories. Your blog and the fact that you swam four miles in the open water after this type of surgery gives me greater confidence that once I’m done healing I can do everything I’ve done before. In terms of future goals, right now I’m signed up for the Lynchburg 5k on August 13. But other than that I haven’t thought too far ahead. You poor, poor thing! Ignore the horror stories. Get into PT/OT as soon as they’ll let you, and take it very, very seriously, and this will all be a painful, annoying memory before you know it. The closest thing I have to a horror story is the warning that you’ll avoid a lot of disappointment down the line by knowing one thing: When your doctors say six-month recovery, they mean six-month recovery. I kept thinking I’d be different, or that it would be six months til I was FULLY recovered … nope. Six months. But at seven months, I was close to 100 percent again, and at eight months, I was able to swim a 5K in the Gulf of Mexico. Good luck with your recovery—it gets better, I promise!